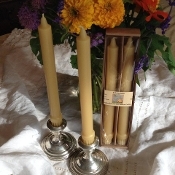 These beautiful long-burning colonial taper candles are elegant enough for special occasions, but you'll want to use them every day. They are 100% pure beeswax, and dripless, making them convenient and easy to use. An any-day evening becomes special, with the peaceful glow of pure beeswax. Plus, you'll enjoy the added benefit of keeping your children mesmerized and quiet!... This really works! Ask our customers. Over 10 hours of burn time per candle. This 10" pair of candles comes gift boxed for only $12.50.